The Field of Dreams RC Club welcomes all who enjoy or are interest in Radio Control Model Aircraft flying. 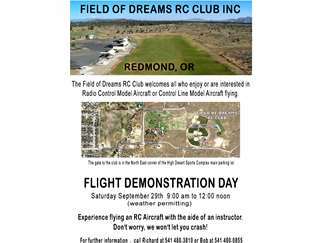 On Saturday September 29th from 9am to Noon (weather permitting) you can experience flying an RC Aircraft with the aid of an instructor. Don't worry, we won't let you crash. The entrance to the field is located in the North East corner of the High Desert Sports Complex main parking lot. Sisters Habitat for Humanity Thrift Store Grand Opening at Sisters Habitat for Humanity Thrift Store 211 E. Cascade Ave.